That looks stunning. I am also liking the yellow calipers on a silver car. Yeah they bring a little "crazy" to the conservative Silver/Black colour scheme don't they. Nothing wrong with a little 'crazy', the individual touches is what makes it yours. No need to spend that sort of money. There's a company called Quickfit SBS in North London who will replace your seatbelt webbing with any colour you like for a few hundred quid for all four belts. They are a recognised specialist in all things related to seatbelts, so quite safe! I've heard about, and seen loads of companies on e-bay that re-webb belts but their disclaimers always put a large element of doubt in my mind, which is never good where safety is concerned. Especially when having my 5 year old in the car. 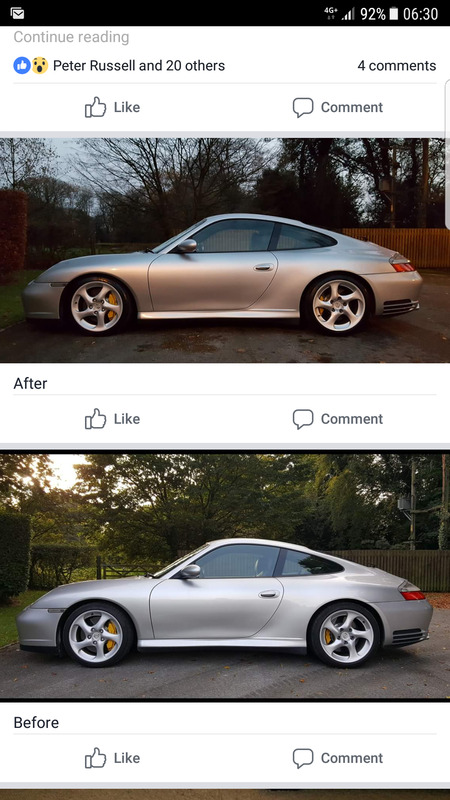 I always figured I'd rather take the plunge financially and buy from Porsche rather than risk regretting trying to save a few quid one day. That's a whole load of Crazy there Pal looks great though!! it's not high on the list at the moment though so there will be other things first. It's looking like an AC overhaul is the next job. I had Quickfit SBS belts put into my old E Type. They were really good quality. Looking good Cappers. Your mate has done a grand job on the detailing. As Black Turbo has shown, a bit of colour really brightens up the standard interior. 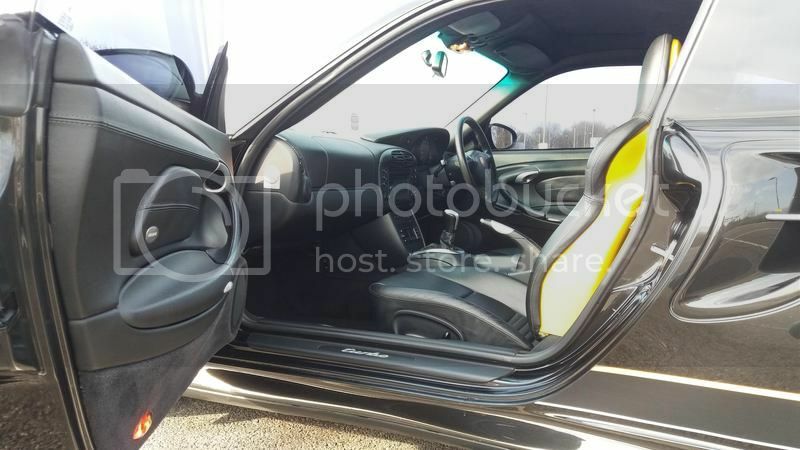 Looking to do similar myself, but I'm not as lucky as you guys with black interiors. Mine is grey so bright primary colours can look a bit out of place. Another vote for SBS belts. I know a couple of people who've used them. Great service and what a difference. These seat belts sound like the real deal then... thanks guys! It's like everything Marky if you are passionate about what you do you will generally do it well/exceptionally. He loves his detailing, bores me to death with half of it but I like the results. So, I finally got round to addressing my knackered and tired top mounts. So first stop was to check battery and see what power was going to it. 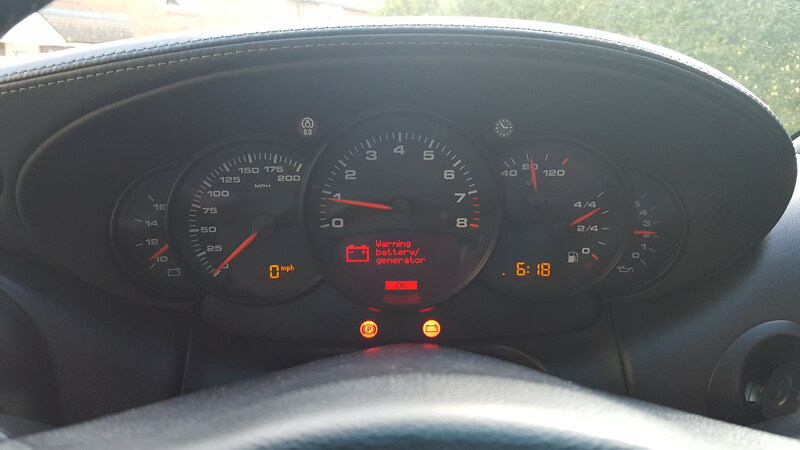 Pretty sure I was told at the time it should be about 16v with the engine running and I had about 11v so concluded it must be a charging issue. 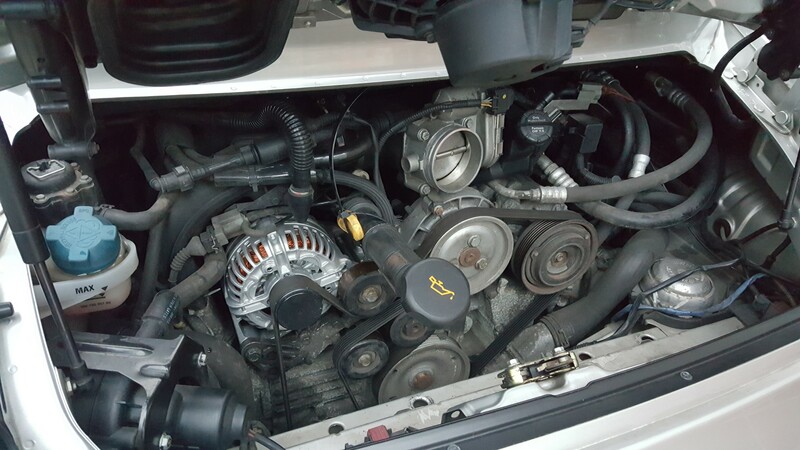 I knew the carbon bushings in the alternator regulator were a common wear and tear issue so i stripped the alternator down and started with them. 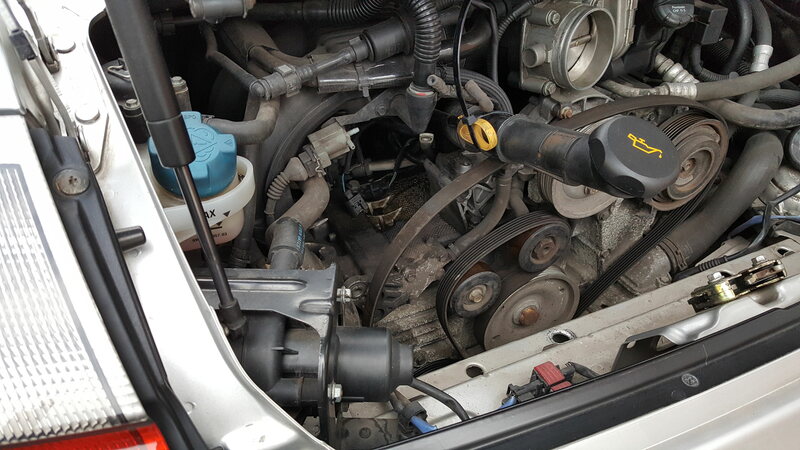 The Carbon bushings looked fine so I decided to replace the alternator as a friend got it me at trade. All back in and sorted! I was well chuffed as this was the first "proper" job I've attempted to tackle on the car myself. 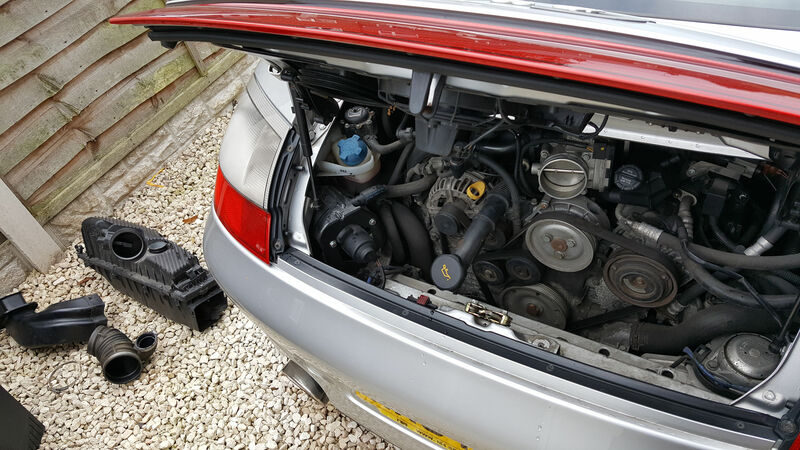 I'd have liked to have gave the engine bay a bit of a clean and a detail whilst the air-box was out but as previously mentioned I needed to get the car to Sports & Classic for the intended suspension overhaul asap as there was a ramp slot waiting for me. 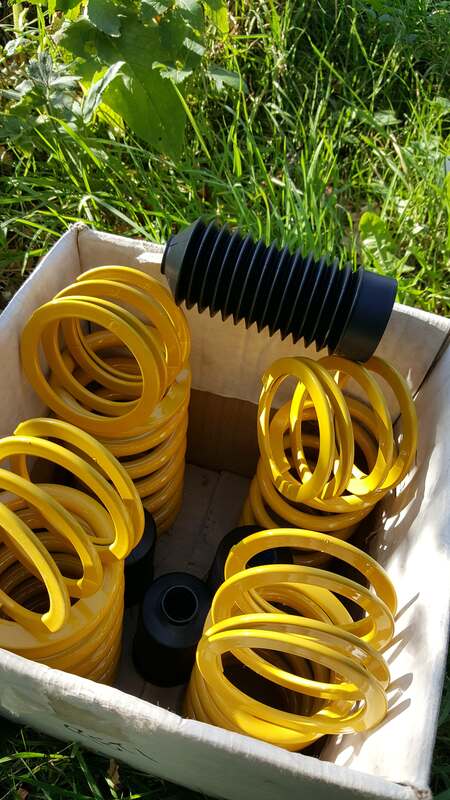 So whilst I was sorting my alternator out, Mike at Sports & Classic had already taken delivery of my Bilstein Coilovers. I had looked at Ohlins, mainly because of the aesthetics and my OCD colour coding, but Mike has alot of experience with Bilstein's, so I decided to trust his judgment on them. 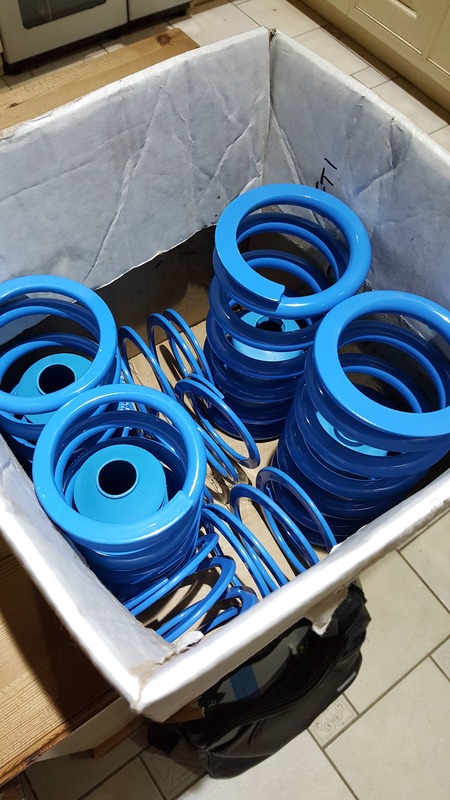 However I couldn't live with the Bilstein Blue Springs and Gaitors so Mike stripped these down for me to take to my local body Shop for painting. So..., happy now that my nice new suspension was aesthetically pleasing and knowing my car was being stripped down, to examine which suspension components would need replacing I went about my daily business. Nice work Cappers. Suspension makes or breaks these cars. Anyone still on original stuff isn't getting the proper driving experience. Trouble is, it isn't apparent until you drive a sorted car. They are fantastic with fresh parts and a proper setup. Yours will be ace once the Bilsteins are on. The Bilstein's are now on and I am very happy. As you say you can't fully appreciate these cars when the suspension is worn and tired. I should have put "to be continued......"
I'll post more on my thoughts as I catch up to that point in my write up. 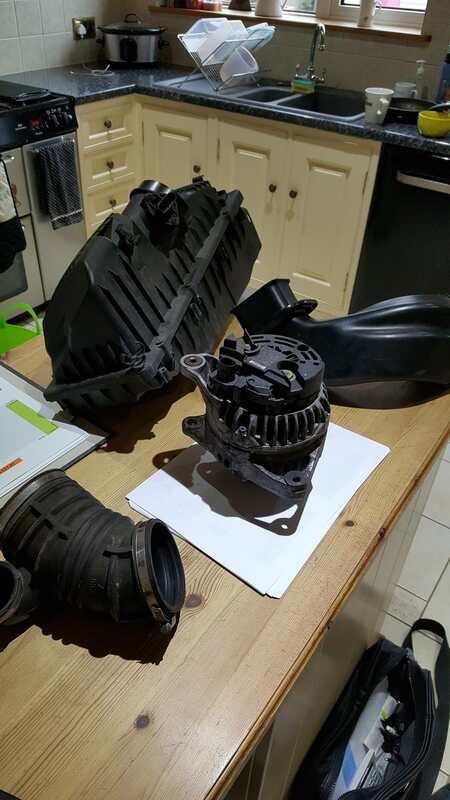 I've got brakes, bodywork and engine mounts to talk about yet... it's cost me a ***** fortune!!!! Ha, I see. I'm used to writing it up pretty much as I carry out the jobs but I'm taking your approach now. Loads going on here but will document it in a month or so. Similar jobs to you, suspension, caliper refurb and bodywork. I look forward to seeing the updates then and congrats on mini-Cappers! You'll be swapping the spanners for Pampers for a little while now. What Bilstein kit did you put on? This was then followed up by 4 wheel alignment and corner weighting. The Bilstein Kit doesn't provide the biggest drop but I have found that if the car had ended up any lower I'd really struggle to get to a few places so it all kinda worked out ok. 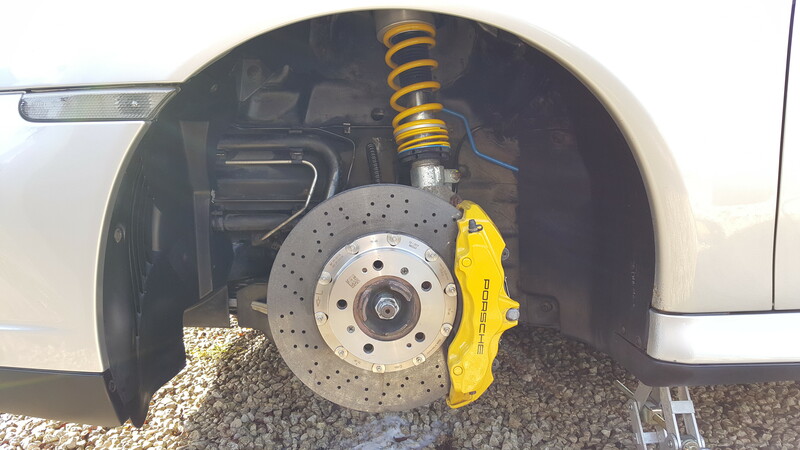 So as the suspension was going on and the car was going back together a few things were found around the braking system that caused concern, and as this car has the lovely PCCB set up it was always going to get expensive!!!!! 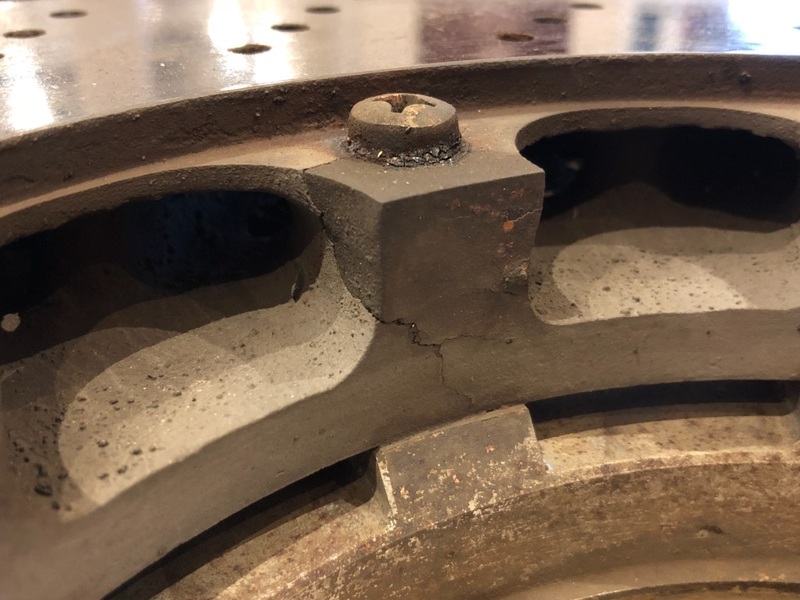 Firstly and the most straight forward, was that the brake pad material had started to come away from the actual locating plate so a full set of pads were required. This was really frustrating as there was so much material left on the old ones. They were literally about 25% worn this does suggest that they were after all the original pads as they had literally just degraded and broken down... pretty amazing that they had done 80k plus. 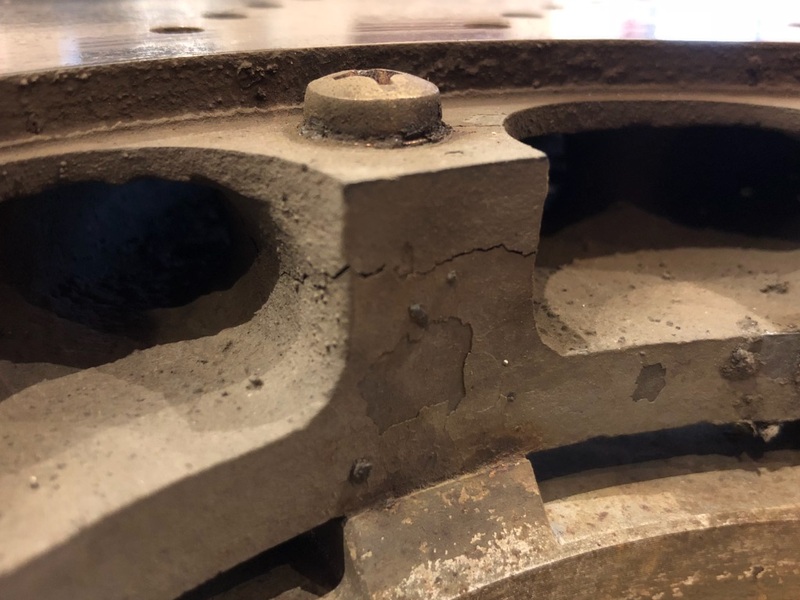 When being built up some small cracks had been found in the front left Ceramic brake disc where they mount to the Bell. These are 1st gen discs, so I originally started looking to source a FL 1st gen Disc as required, because Porsche no longer sells them. If I couldn't find one this would have meant having to buy 2x 2nd gen discs from Porsche as you can't mix across axles (not that I would have wanted to as the drill pattern was different anyway). Obviously this was mental money!!!! After nearly 2 months I had no luck sourcing a FL 1st gen disc so had to conceed that my only 2 options were to bite the bullet and buy 2x 2nd gen discs or go back to steels. Going back to steels really wasn't an option for me as the unsprung weight saving of the PCCB's were the main reason for me buying this car in particular. The last thing I wanted to do was spend a large chunk of money on steels to then feel the added unsprung weight in the driving experience... thus making the car feel less special/capable. So with Porsche wanting 9.5k GBP for 2x break discs I travelled the world from my laptop looking for a deal. I eventually managed to get a pair of 2nd gen discs from Teile.com for a reasonable 6k euros, haha. 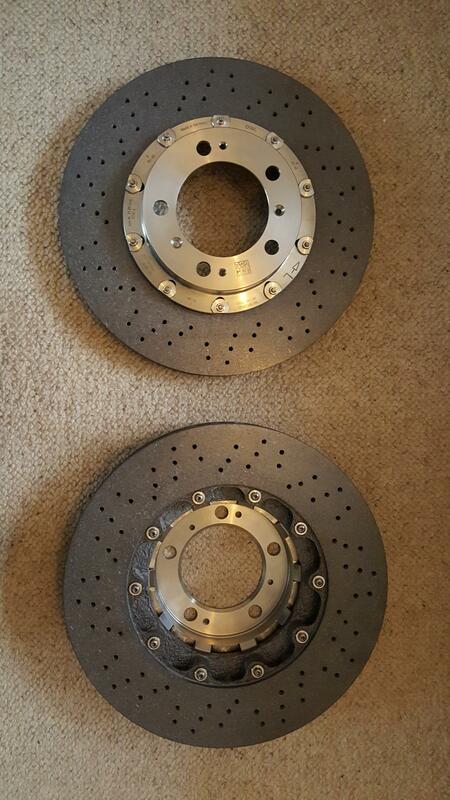 The 2nd gen discs intrestingly are what are currently on the 2017 Boxsters. Craftsmanship on these in hand is truly awesome and precise, it was almost a shame to put them on the car. This now meant my suspension work could be finished and I could start enjoying my car again. This was by far the most testing period of Porsche ownership that I have had but I've come through it and I'm still loving the car. Next write up is the bodywork, and I can report that the brakes and suspension have been fantastic. I'm still learning where the new suspension limits are but it's great fun! 6k euros, Holy Moly!!! I totally understand the want to keep the PCCB but man that's a big bill. 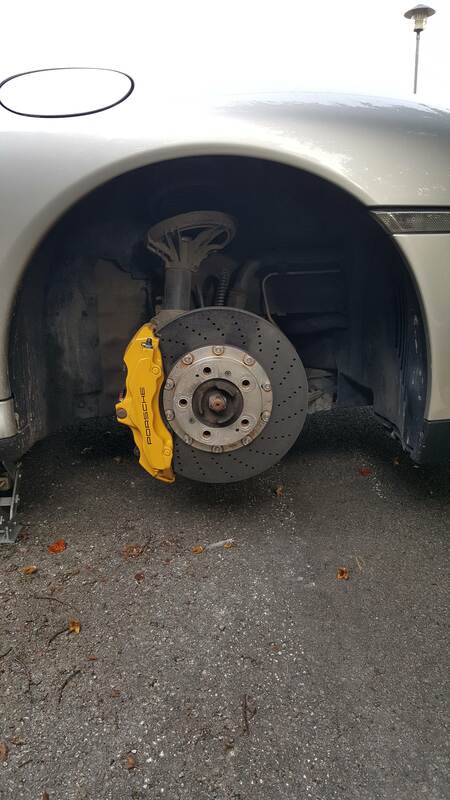 Its not like the std brakes are crap. I would have gone steel and retained the originals for resale time. I used Ds2500 pads on my old C4s and not once did they get close to fading. 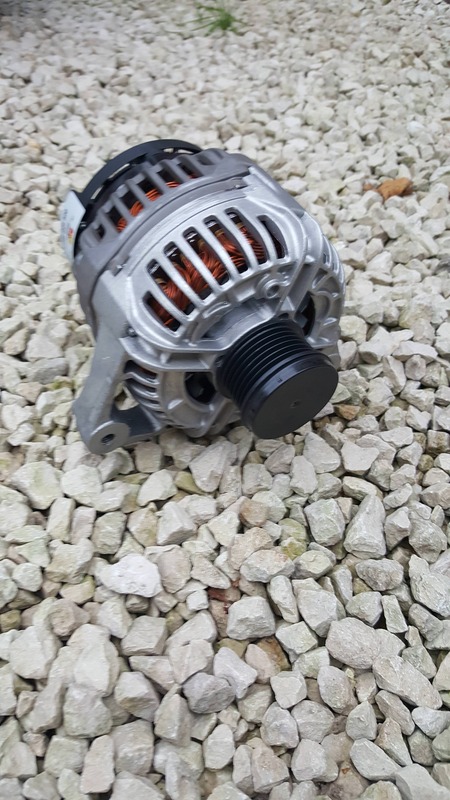 You mention unsprung weight which again I totally agree is great to reduce, thing is you have the original wheels which on a C4s are very heavy so what you have saved in brakes you could also save by getting hollow spoke wheels as well. €6k for 2 discs... GULP! I balked at nearly £1,200 for discs and pads all round on mine last service. €6k for 2x discs. + coilovers etc, keep going and Dammit may have some competition on his hands! Time to get a full car respray to sort out those stone chips.